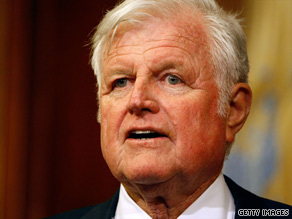 For almost 50 years, Sen. Ted Kennedy pushed unsuccessfully for legislation that would reform the health care system and ensure coverage for every American. Ironically, his death might bring about a change of tactics that would help reach the goal he was unable to achieve in life, one veteran political analyst says. “Kennedy’s departure may in fact increase the chances that we get a more sweeping health care bill,” American Enterprise Institute analyst Norman Ornstein recently told CNN. As Congress prepares to reconvene and resume the fight over President Obama’s top domestic priority, Democratic leaders are expressing concern over the consequences of Kennedy’s passing. Kennedy was the chairman of the critical Senate Health, Education, Labor, and Pensions Committee, and provided a potential 60th Democratic vote, which would be needed to break a Republican Senate filibuster. Watch CNN’s Jessica Yellin report on Kennedy, consensus and the health care issue » He also was a highly respected negotiator, capable of crafting compromises with political opponents on the thorniest issues. He had “a unique way of sitting down with the parties at a table and making the right concessions, which really are the essence of successful negotiations,” Sen. John McCain, R-Arizona, said Sunday on ABC’s “This Week.” Watch Sen. John McCain at a town hall event on health care » The White House is still publicly pushing for a bipartisan compromise. And a group of six Senate negotiators — three Democrats and three Republicans — is working on a bill capable of winning votes on both sides of the aisle. But Kennedy’s death, Ornstein argued, could change Democratic calculations on how to proceed from this point. “The possibility the Democrats have of getting a bill with 60 votes now — which requires compromising and getting Republicans — has just gone down,” Ornstein told CNN. Without Kennedy, Democrats now have 57 senators. Two independents — Sen. Joe Lieberman of Connecticut and Sen. Bernie Sanders of Vermont — caucus with the Democrats. Watch CNN’s “blogger bunch” discuss Kennedy’s legacy and what lies ahead in the Senate » One Democrat — 91-year-old Sen. Robert Byrd of West Virginia — is in questionable health and may not be able to play any role in the health care debate. Current Massachusetts law does not allow that state’s Democratic governor to appoint an interim replacement for Kennedy, and a special election to fill his seat will not occur for several months. As a result, Ornstein argued, Democratic leaders may now try to short-circuit the traditional Senate legislative process by passing a more partisan bill through an obscure tactic known as reconciliation, a type of budget maneuver that requires only a simple majority — 51 votes — to pass. Republicans have equated such a move to legislative warfare. “That is really sort of denying democracy,” GOP Rep. Paul Ryan of Wisconsin said on “FOX News Sunday” last weekend. Sen. Orrin Hatch, R-Utah, has called it “an abuse of the process.” Some Democrats have also expressed discomfort with the idea. Sen. Kent Conrad of North Dakota, one of the Democrats working to hammer out a bipartisan bill, recently argued that using the reconciliation tactic “does not work very well.” “When you examine the way reconciliation works, it was designed solely for deficit reduction. … It never contemplated substantive legislation,” he said Sunday on CBS’ “Face the Nation.” Ramming a bill through on a party-line vote may also be unpopular with the public as a whole. A Quinnipiac University survey in early August showed that 59 percent of registered voters nationwide oppose passage of health-care legislation if the bill fails to win bipartisan support. If Democrats nevertheless resort to reconciliation, Ornstein said, they would be “sorely tempted” to include the kind of government-funded public health insurance option favored by Kennedy and the rest of the party’s liberal base. Almost every Republican opposes such an option, claiming it would destroy the current private-insurance-based system. But if Democrats go it alone, by one line of reasoning, there is no reason not to get as much as possible. “So there may be a great irony here,” Ornstein said. “Kennedy, by not being there, may have increased the chances of getting something closer to what he would have preferred.” Can Democratic leaders use the emotion tied to Kennedy’s death to forge a compromise with Republicans “My hope is that this will cause people to take a breath, and step back and start talking to each other again in civil tones about what needs to be done,” Democratic Sen. Chris Dodd of Connecticut, a close Kennedy friend, said Wednesday. “Hopefully, at this moment of reflection some people will reconsider the positions they’ve taken,” added Rep. Chris Van Hollen of Maryland, a member of the House Democratic leadership. Not likely, Ornstein argued.